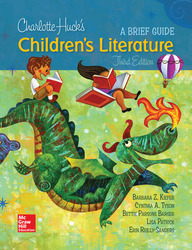 Now in its 3rd edition, Charlotte Huck’s Children’s Literature: A Brief Guide, provides essential information for designing pre-K-to-8 literature programs. Expertly designed in a vibrant, full-color format, this streamlined text has a strong emphasis on researching, evaluating, and implementing quality books in the classroom, the critical skills needed to search for and select literature. Kiefer’s guide gives readers the tools they need to evaluate books, create curriculum, and foster a lifelong love of reading for students.